A glue gun post: Continued. Do all Kims love glue guns? Sketchy Food Coloring Water Color. Or something. My life is a zoo. Some easy Nautical Stuff. Too easy. Tomatoes in a pie? That.is.awesome. Spunky Swap Meet - number two! 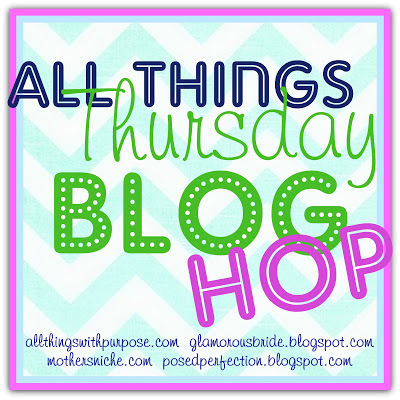 Soooo, remember 2 million years ago when I did that blog swap with Spunky Junky? The second one, not the first one. It wasn't 2 million years ago? Oh. Huh. Just feels like it. What could I show you that would be just a little different? I decided to try my hand at painting with food coloring. I suppose we could call it Food Coloring Water Color. Or something like that. I liked the sketchiness of it and the casual feel. It reminded me of something out of a kid's sketchbook. But I really did NOT like the $299.95 price tag. Seriously Anthro? Seriously??? water and food coloring. Obviously. First off, you'll want a plan. 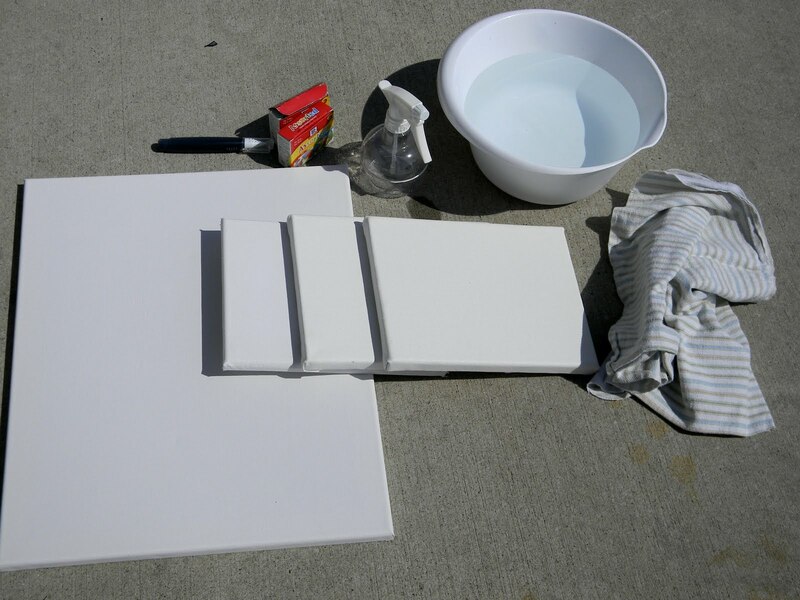 Think up some awesome design and figure out how you want to arrange your canvases. Sketching things out ahead of time on paper would be helpful at this point. A little tip: tight, intricate designs are not going to work well with this method. You want something more abstract. Anything pastoral or representing nature would be good. Or just shapes and such. But nothing specific like argyle or quatrefoil, right? 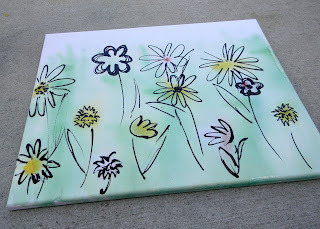 I decided that my large canvas would go on the bottom and be grassy, dotted with flowers. Kind of like a representation of my blog header, I guess. 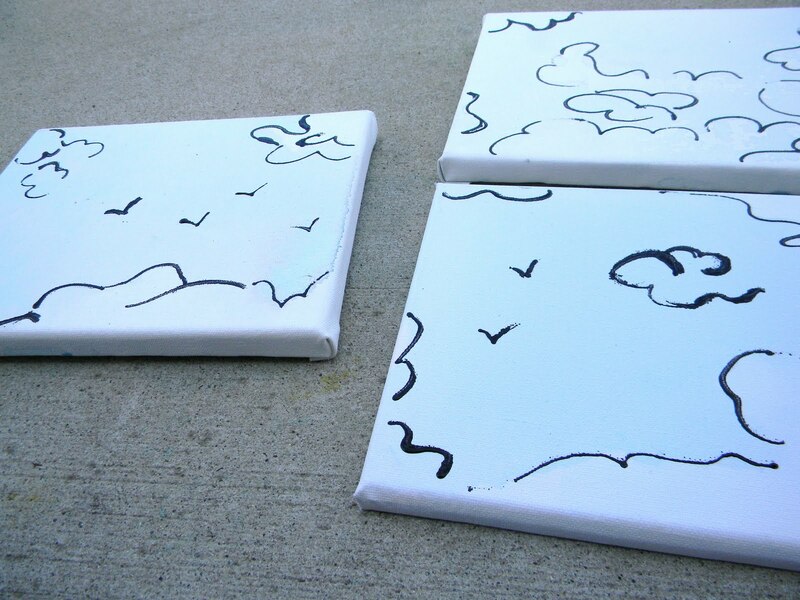 Then I would put the smaller canvases above and paint those like clouds. I explain all of this because my tutorial will obviously be specific to MY design - so just adjust colors and such for yours. I started with the base color, which in my case was blue. Fill your spray bottle about half way and add as many drops of food coloring as you want to get the saturation you're going for. On the canvas, the food coloring will be MUCH more pastel than in the bottle. 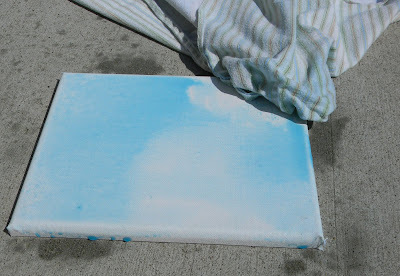 Now, using the "mist" setting on your spray bottle, just spray your canvas all over. Here's another tip: You'll want to have a base color in your design - something in the background that's dominant. Why? 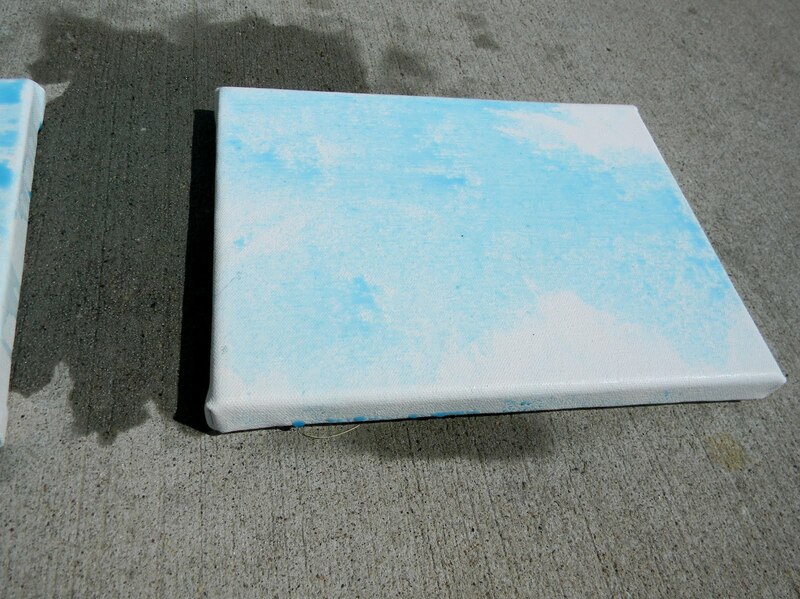 Because it's important to really soak the canvas so it doesn't remain hard and stiff - resistant to the coloring. 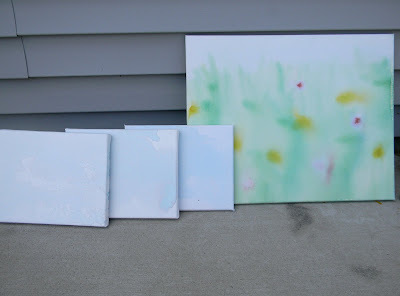 If you don't use enough water, the canvas will look mottled and you will have spots of canvas showing through and areas that look stained or crusty. 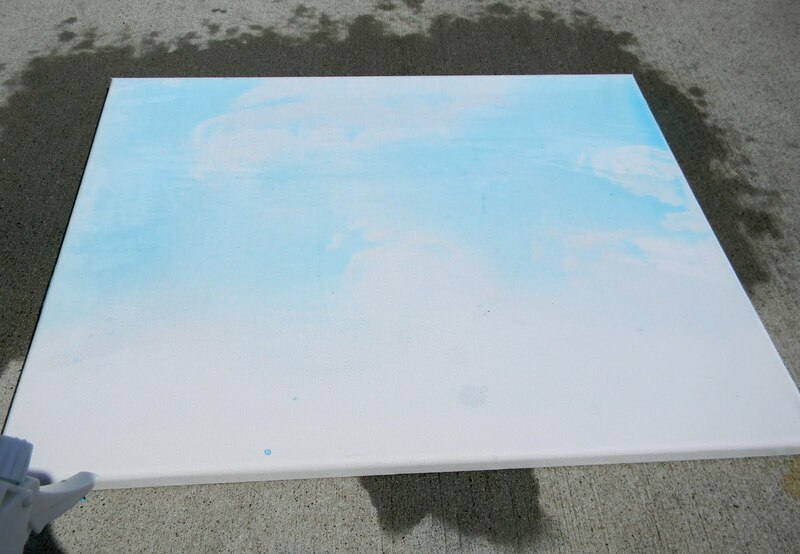 Once you've saturated your canvas with your base color, take your rag and blot it off in some areas. Then use the base color and spray it all over again. And blot again. Just keep repeating these two steps until you have the desired coloring/pattern you like. See? Doesn't that kind of look like clouds? 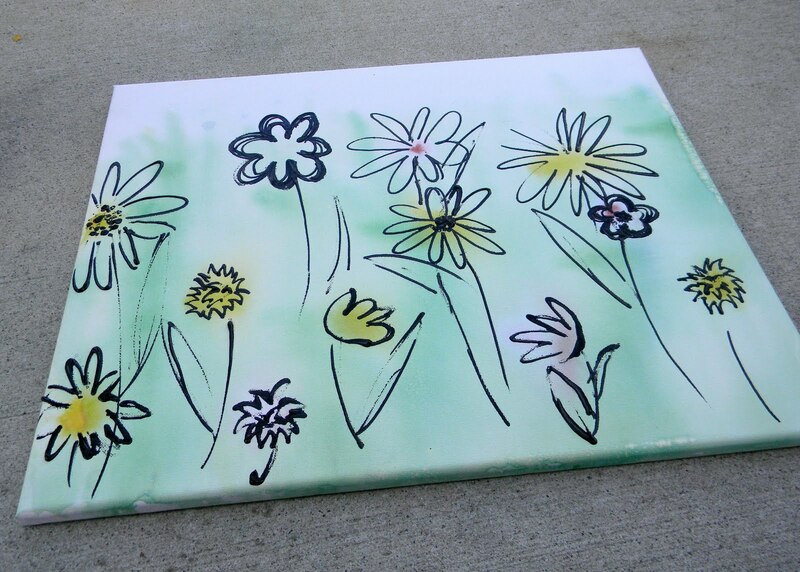 I used two base colors for the big canvas, because I didn't want my grass to be teal. 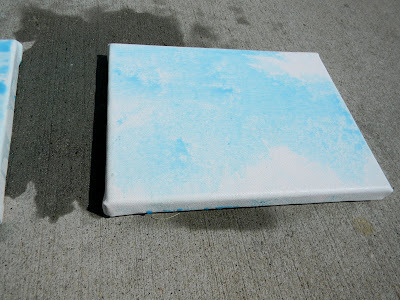 SO, just spray the top of the canvas with blue and the bottom all over with green. SATURATE. 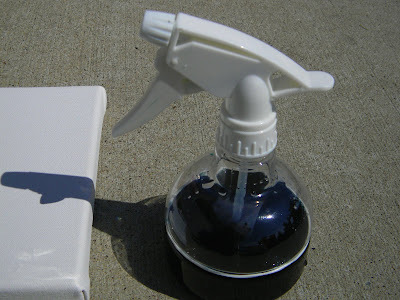 Adjust your bottle so the nozzle is more of a stream. 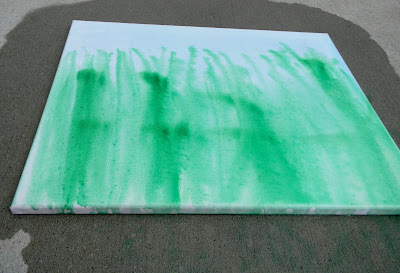 Use the green food coloring and water to spray jets of green stripes on the bottom 3/4 of the canvas. 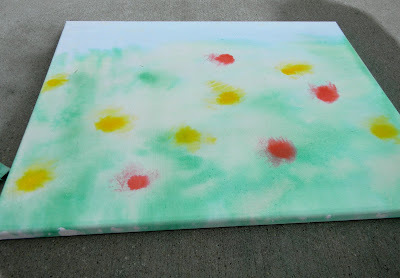 Use the mister setting again to spray some blops of color around in the grass to add dimension. 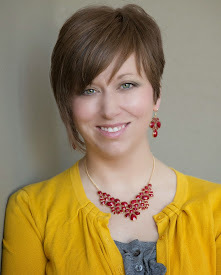 I used red and yellow together for a light orange. Then I blotted it off. Next, drop red and yellow dots of food coloring directly from the little squeezy dropper onto the canvas randomly. 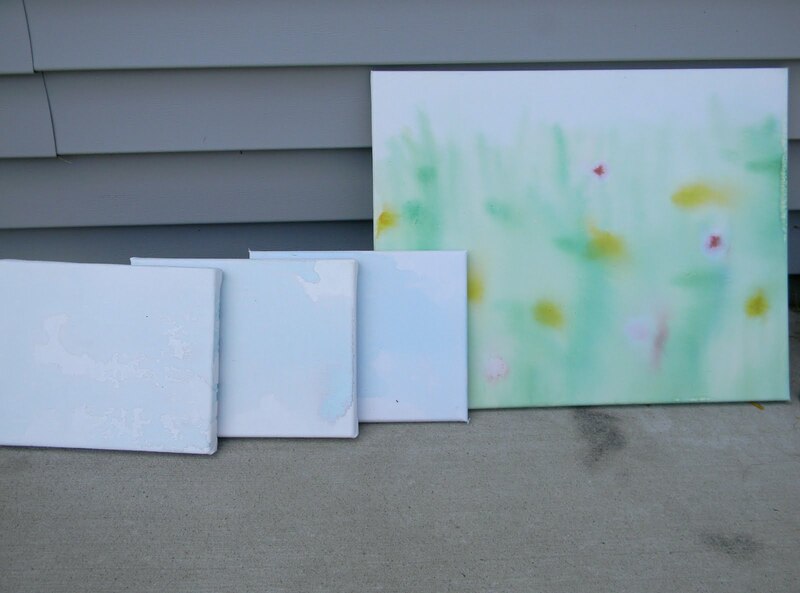 Your canvases look a little like this when you're done. 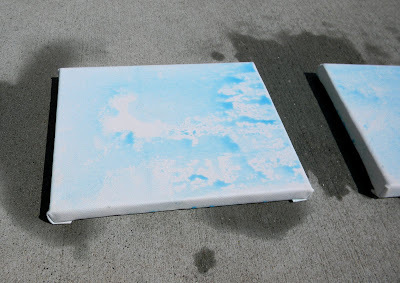 Let them sit out in the sun to really set the food coloring and dry off all the water. Now, if at this point you think the color is a little too faded, you can repeat the process. I liked the faded look. 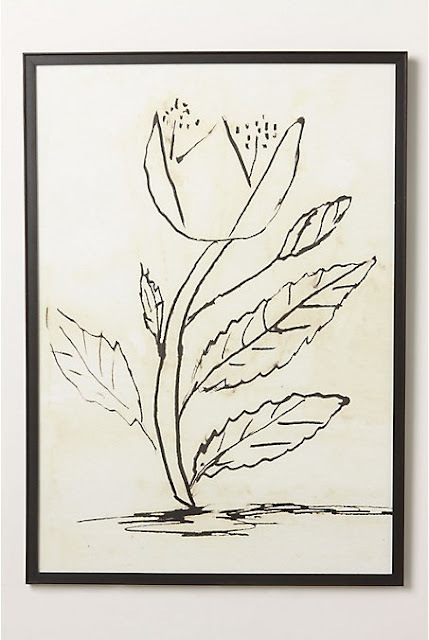 When you're done, you can go to town sketching floral shapes around the blobs of color with your black paint pen. Add a few leaves. 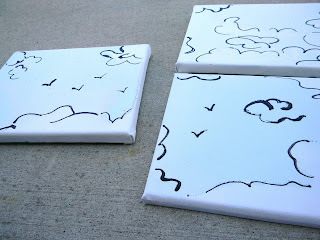 And you can lightly outline the clouds. Maybe add a few geese for fun. Can I take a moment to tell you that I love those fabric paint pens?? This was my first time using one and I will totally use it again. I love that it is just slightly shiny and raised off the surface of the canvas - it adds dimension and texture so it doesn't look so flat. And here, in all it's bad lighting glory is my Food Coloring Water Color nature scene in my upstairs hallway. I think it dresses up the hallway but doesn't feel too formal, which I really like. It reminds me of kid's art - which I have a fondness for. I liked the idea so much, I've begun work on ANOTHER food coloring project that may or may not include some sewing as well... hmmm... TBA. Please ignore the scuffs and marks all over my walls. We haven't painted the hallway yet. Come on, we've only been here for three years. 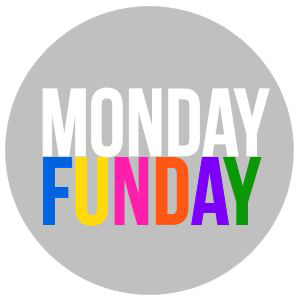 *Be sure to check just below for all the fun parties I link to! 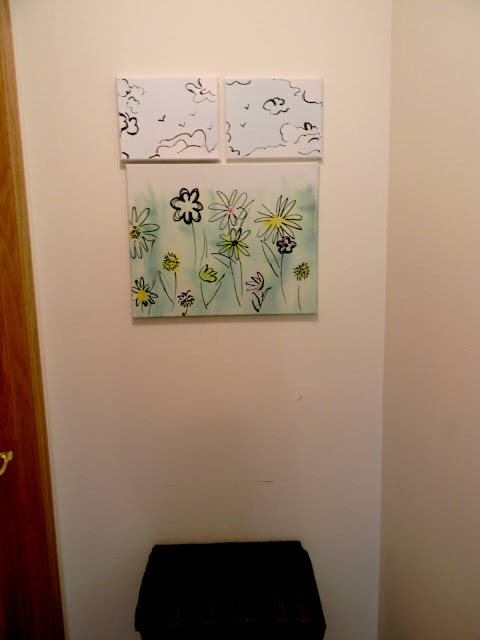 I love this adorable triptych! Wasn't sure I was going to, and then pow, black markers! Lovely and looks really fun. That is beautiful good job. I just wanted to let you know that I featured your cute nstriped skirt you made for your little girl from my party show and share. come and check it out, grab a featured button and make sure to come and link this cute canvas up this week.